Heat oven to 450°F. In medium microwavable bowl, place chocolate chips, half and half, and butter. Microwave on High 2 minutes to 2 minutes 30 seconds or until melted, stirring once or twice. Stir in peppermint extract. Beat with electric mixer or wire whisk until well blended. Refrigerate 45 to 60 minutes or until thickened. Meanwhile, make pie crust as directed on box for One-Crust Baked Shell using 9-inch glass pie plate. Bake 9 to 11 minutes or until golden brown. Cool completely, about 30 minutes. In small microwavable bowl, place white chocolate chunks and whipping cream. Microwave on High 1 minute 30 seconds or until smooth, stirring once or twice. Cover and refrigerate 2 hours or until chilled. Pour semisweet chocolate mixture into cooled baked shell. Reserve 3 peppermint candies. Crush remaining candies and sprinkle over top. Refrigerate 2 hours or until firm. In medium bowl, beat white chocolate mixture with electric mixer on high speed until light and fluffy. Do not overbeat. Carefully spoon and spread over chocolate. Refrigerate at least 4 hours or until firm. 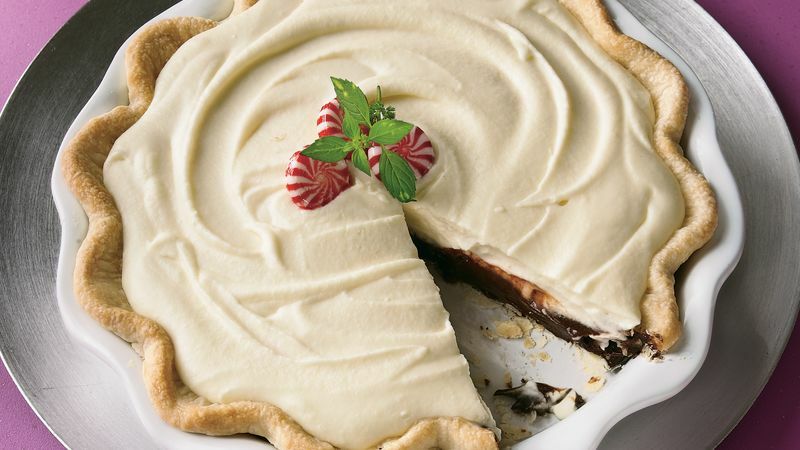 Just before serving, garnish with peppermint candies or fresh mint. Store in refrigerator. The pie can be made and stored in the refrigerator up to 24 hours before serving.